President Donald Trump visits a charred neighborhood impacted by the wildfires. 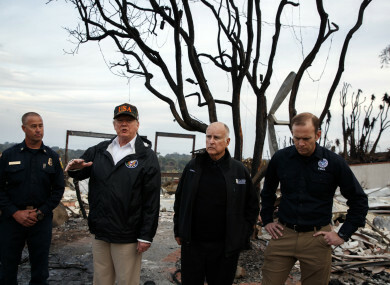 US PRESIDENT DONALD Trump has expressed sadness at the devastation caused by fires in a California town, but persisted in his controversial claim that forest mismanagement is responsible for the tragedy which has left 76 dead and more than 1,000 listed as missing. You look at other countries where they do it differently, and it’s a whole different story. I was with the President of Finland he said it was a ‘forest nation’, he said ‘we’re a forest nation’. And they spend a lot of time on raking and cleaning and they don’t have any problem, and when they do it’s a very small problem. Brian Rice, president of California Professional Firefighters, called Trump’s earlier remarks “ill-informed,” noting the federal government had cut spending on forest management. The inferno erupted 8 November, laying waste to Paradise in the northern foothills of the Sierra Nevada mountains and sending thousands fleeing. The Camp Fire and another huge blaze have created a serious smoke problem across vast areas of the country’s largest state, and when Trump stepped out of Air Force One at Beale Air Force Base north of capital city Sacramento, the sun struggled to cut through haze so dense it covered the base like a fog. Butte County Sheriff Kory Honea had on Friday told reporters the number of people unaccounted soared from 631 to 1,011 in 24 hours as authorities received more reports of people missing, and after earlier emergency calls were reviewed. He called it “a dynamic list,” while noting there could be duplicates and some people who had escaped could be unaware they were listed as missing. More than 300 people who were listed as missing have now been found. Roslyn Roberts, 73, who fled from her home in Paradise, said she voted for Trump but disagrees with his views about forest management. “Just trying to make it day by day. It’s all we can do,” said Dustin Kimball, who worked at the Paradise cemetery. The Camp Fire has burned 149,000 acres and was 55% contained late Saturday, California’s fire service said. Smoke from the fire forced schools to close in San Francisco on Friday and the city’s iconic cable cars had to suspend service. The Golden Gate Bridge was shrouded in thick smog. “I’m still going to keep on looking and hope for the best,” Jonathan Clark told AFP. He was hunting for his brother, sister-in-law and nephew. That inferno, which is about two-thirds the size of the Camp Fire, was 84%contained Saturday as Trump surveyed the damage at well-to-do homes there. Email “'Sad' Donald Trump visits site of California wildfires and again blames forest mismanagement”. Feedback on “'Sad' Donald Trump visits site of California wildfires and again blames forest mismanagement”.